For disinfecting manicure and pedicure implements, skin care implements, hair shears, and non-porous files. 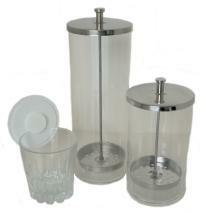 The medium and large sterilizer jars have a stainless steel lift basket attached to the stainless steel lid for easy removal of nail files and implements. Small jar comes with a white plastic lid. 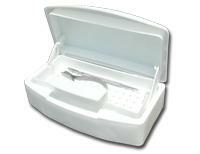 White large capacity tray for sanitizing hair care tools, manicure and pedicure implements. Comes with a convenient, removable self draining basket allows complete submersion of tools and implements when close and raises up when the lid is opened. Durable chemical resistant plastic tray. Will not discolor. See-through sterilization pouch with triple seal and heat processed that is consistent and strong, eliminating the risk of shattering or tearing. Wide self-seal adhesive strip to ensure the integrity of contents after sterilization process. Easy to read "Color Changing Indicator Arrows" printed on each pouch assuring proper sterilization process by steam, chemical vapor, or EtO. Clean separation (peeling) of the 4-ply see-through film (from the Medical grade paper) maintains the sterility of the contents until their use. Blue tinted transparent film for easier identification of contents and possible punctures by contrast of color. ADA seal accepted.